This weekend was a get together for all of team 9bar and partners. 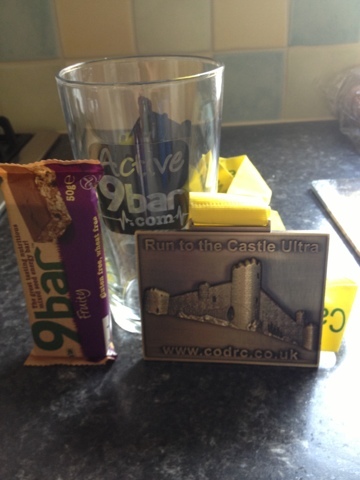 On Saturday the ultra runners on the team took part in the 9bar run to the castle race which was 40 miles. The other members of the team ( cyclists; triathletes; injured ultra runners and the GB white water raft team) did a shorter run in the morning, had a nice lunch then socialised / sunbathed / cheered in the ultra runners. The less said about my run the better! I am rubbish at navigation ( we had 4 pages of instructions and 6 maps to help us) and am not so good off road - I love canals and non technical trial but worry about falling over when there are rocks / uneven ground so have to walk a lot. The run was a nice route - good views, a mix of terrain ( some road, quite a lot of beach, trail, tricky bits, hills). 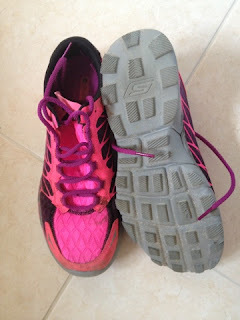 I thought it would be a good opportunity to test out some new trail shoes as Phil was meeting me at a few places so I could easily change them - no need they were great. The route was on the Welsh coastal path so marked in places ( just not enough places). 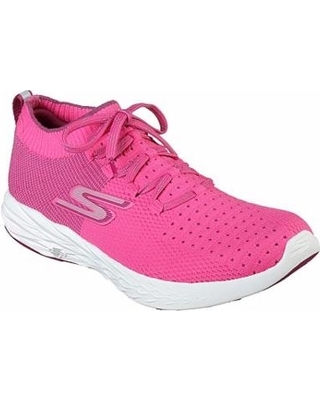 Needless to say I got very lost the worse being about 14 miles where I seemed to be going round in circles in a field with sheep, I just couldn't work out where I was going and got so confused I couldn't even retrace my footsteps as I couldn't work out where I had come from! After a phonecall to the RD I got back on track by climbing a stone wall then I saw ahead Rosemary so gave her a shout. She waited for me to get to her but that involved climbing a barbed wire fence! At least I was back on track! We stayed together for the rest of the race, getting lost several more times. 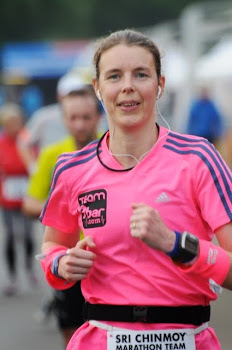 I am really not sure I would have finished if I had been on my own as I was getting so fed up being lost. With company everything is so much more bearable and we had a great time putting the world to rights! We ended up taking so long that I was late for the team evening meal which I was really disappointed about. Had I realised then I would probably have dropped out at the last checkpoint as Phil was meeting me on the course so could have picked me up. I wasn't really looking at the time so hadn't realised quite how long we were taking until it was too late. As is always the case with Denzils races we got a great medal and a pint glass. There were 4 checkpoints which were well stocked with 9bars and other goodies. We went to all 4 which is the idea, quite a few people seemed to miss some out due to being lost. Needless to say I won't be doing the race next year ( I will do laps of the car park instead!) I would recommend it if you like off road and navigation, it was just not for me. After the quickest post race shower we had a nice meal - changing seats between courses so we got to meet different people. After the food there were a few thank-yous followed by various humorous awards with home made trophies which looked fab. Then drinks in the lounge area. We had a group breakfast the next morning. 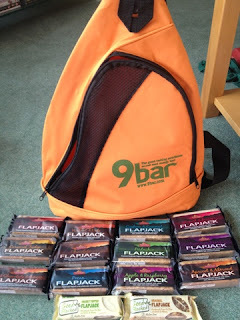 I got to chat to Mr 9bar, the man behind the recent new flavours ( fruity as well as the savoury bars) he hinted that there are some more new ones on the way 😃. During the week Alan had been teasing us about the contents of the goody bags they were giving us! I had been hoping for fruity 9bars whilst Richard was hoping for an iPad or Rolex! During breakfast Alan ( with his cheecky grin) gave me my goody bag, he said it had a box of fruity in it, it certainly felt hopeful as he was handing it over. But no, it was pumpkin ( my least fav flavour ) - he thinks he is so funny 😛. After breakfast we were all given the proper goody bag full of wholebake flapjacks - wholebake make 9bars as well as these flapjacks in loads of different flavours, today I tried the caramel which was rather yummy, think it will be the coconut and cashew one next 🐷. What made me very happy was that Phil also got a goody bag so I don't need to share! It was great the way they included partners during the whole weekend.